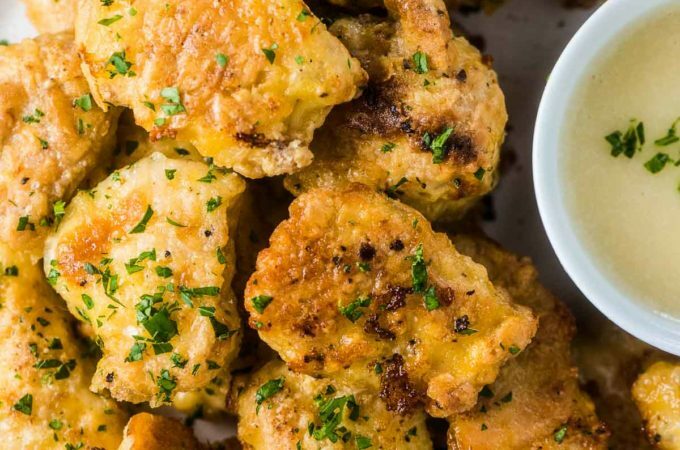 Healthy Baked Chicken Nuggets aren't just for kids! They make a quick and easy lunch or dinner that we all love. 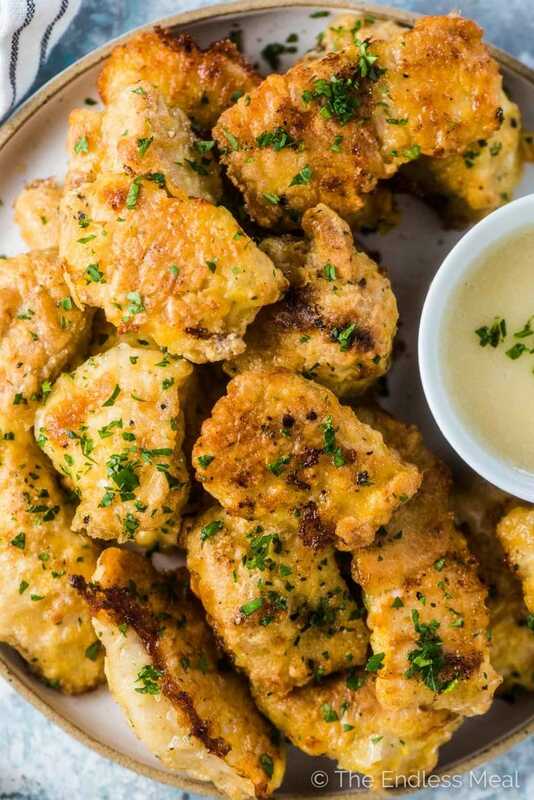 These gluten-free and paleo chicken nuggets are crispy and delicious and can easily be made ahead and frozen. Perfect for meal prep! The last time I ate chicken nuggets I was probably a teenager. And why (WHY?) haven't I had them since? They're every bit as good as I remember them being. I feel like a fool for waiting so long to reacquaint myself with my childhood favorite lunch. The chicken nuggets I remember from when I was a kid came in a package stored in the freezer. They were easy enough for 7-year-old me to pull out the package, put a few (several dozen) onto a baking tray and pop in the oven. 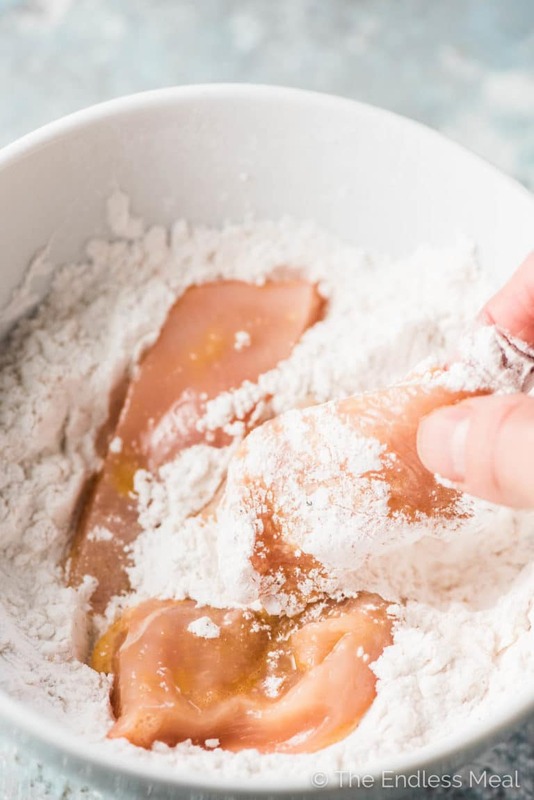 I've got a batch of these healthy baked chicken nuggets in my freezer right now cause somedays 40-year-old me still needs an easy to make lunch. Crispy on the outside and tender meat inside = delicious. They're super easy to make. Not as easy as opening a pre-made bag, but 100% worth the few extra steps. They are made with all good for you ingredients. 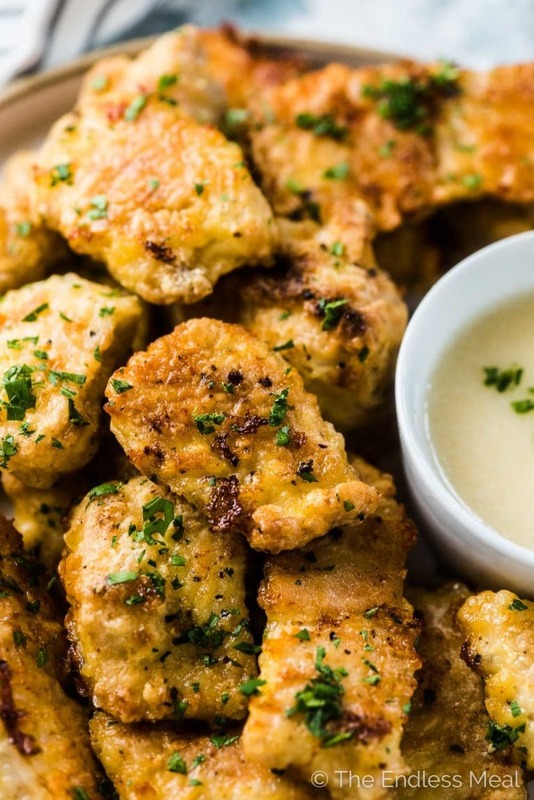 Paleo + gluten-free chicken nuggets. Freezer friendly so you can make a big batch and cook them as you want them. Chicken. 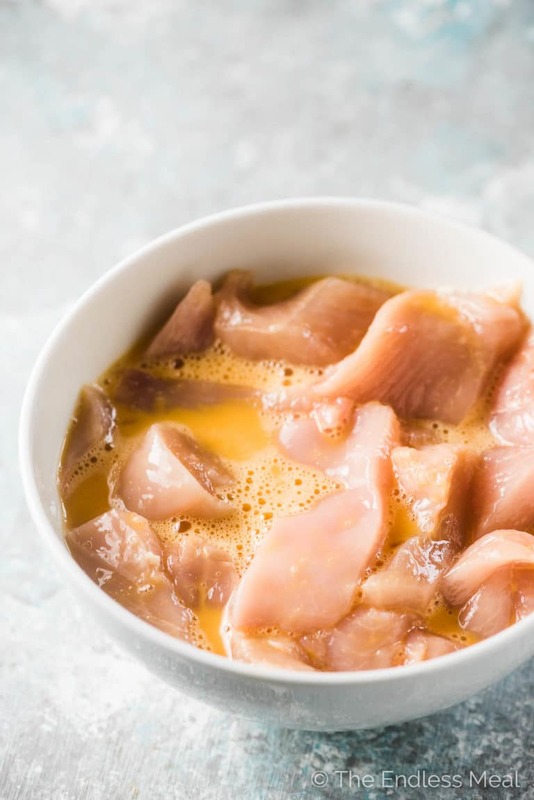 I cut up chicken breasts but you could easily substitute chicken tenders. 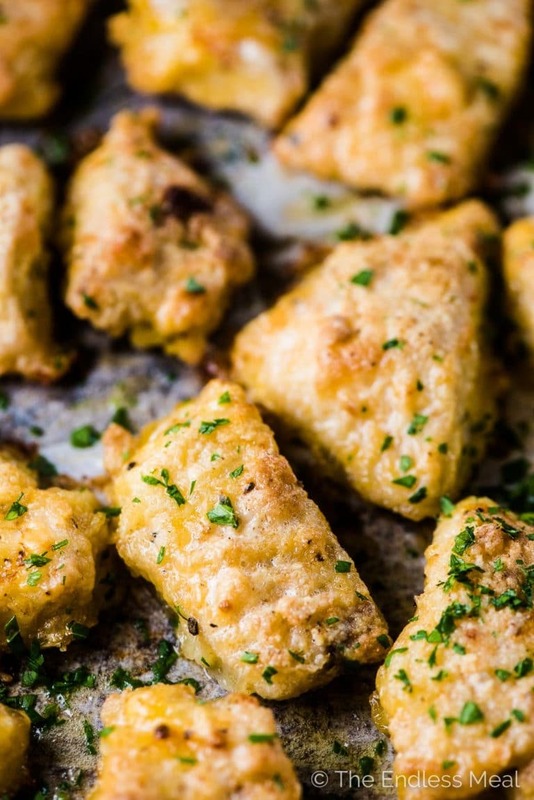 Boneless thighs give these nuggets even more flavor. Egg. This is what helps the breading stick. If there is an egg allergy in your family, a little oil or some milk works, too. Starch. I opt for tapioca starch as it's paleo and grain-free. Potato starch, cornstarch, and rice flour all work just as well. Spices. Onion powder, garlic powder, salt, and pepper give the chicken nuggets the right amount of flavor. Cayenne is nice if you want to add a hint of heat. To make these nuggets, all you have to do is dip the chicken in the egg, then in starch mixed with spices, then bake them. So easy! There are few better things than coming home starving and remembering that you're a domestic rockstar and have dinner waiting for you to pull out of the freezer and pop into the oven. These healthy nuggets are the best for meal prep. Pop the nuggets (on the baking sheet) into your freezer. Let them freeze then put them into a resealable plastic bag. When you're ready to eat them, put them back on a tray and into your oven. Add about 15 extra minutes to the baking time. That's it! It's super easy to make a big batch and save some for later. Preheat the oven to 420 degrees. Line a baking sheet with parchment paper. Whisk together the tapioca starch, garlic powder, onion powder, salt, and pepper in a medium-sized bowl. Whisk the egg in another medium-sized bowl. Drizzle the oil over the chicken nuggets then put them in the oven. Bake for 20 minutes, broiling the last 5 minutes to brown the tops. Are these Whole30 compliant as well as Paleo? I’m still learning how whole30works but i want to try these!they look delicious and easy. Your Chicken Nuggets look 100x better than anything you could buy in the freezer section of the grocery store or anything you could order in a restaurant. And I love that they are healthier and can be frozen to pull out at a later date. Also, your photos are so enticing and mouthwatering. Thanks again for sharing. Awww thank you so much! I’m so happy to hear you like them!! I tried this and it was amazing, I have been looking for a healthy version of of chicken nuggets for my grand kids. I added dried oregano and paprika, also I used almond flour instead of tapioca flour. I have used some of your recipes in the past loved them. Keep at it you are good. I love this recipe… I’ll try it as soon as I can. These look amazing……I bet you could do them up and freeze them in a bag for the kids to take out and re-heat. I love your healthy version.